Interview: As a sardonic buffoon, the actor casts an ominous shadow while a band of players tries to reverse the tragedy of the 1903 Iroquois Theatre fire. At Neo-Futurists, through Dec. 30. His clown suit, a bit tattered and soiled with soot, looks like it once might have been pure white. But the character Dean Evans plays in the Neo-Futurists’ production of “Burning Bluebeard” is decidedly dark, one might even say spectral. And magnetic. In this manic re-creation of the 1903 fire that destroyed Chicago’s Iroquois Theatre and took more than 600 lives, Evans’ Fancy Clown – as his nameless character came to be known within the company – is mesmerizing in its vaguely demonic postures and movements, and in the coolly detached voice Evans brings to his commentary on horrific events that no amount of replaying can alter. But all the other players – clowns, actually – express their desperate hope that their re-enactment of the show taking place on that fateful day, a light-weight musical treatment of the bloody Duke Bluebeard legend, can come out differently, without the inferno and chaos and massive loss of life. In that hopeless circularity, “Burning Bluebeard,” by Neo-Futurists member Jay Torrence, brings to mind the existential mode of Beckett’s “Waiting for Godot” or indeed the grinding surrealism of the contemporary Irish playwright Enda Walsh. If the Iroquois tragedy comes under the heading of man’s fate, then it’s his condemnation to keep replaying that tape until a happier outcome is achieved: the classic definition of insanity. “It’s almost like Beckett had written a fairy tale,” suggests Evans. The bleak humor is worthy of Fancy Clown. “But I had to separate this character from Honey Buns, which is very personal to me,” he says. “I couldn’t imagine Honey Buns speaking someone else’s words.” So just the voice was kept. Early in the workshopping process, says Evans, playwright Torrence thought of “Burning Bluebeard” as purely a clown show, with very little dialogue and a great deal of interaction between players and audience. In the end, Torrence entrusted his story to a small company of clowns who combine something like conventional dialogue with elaborate physicality. Critically dependent on verbal telling is the play’s finale, an extended and graphic account of the Iroquois fire delivered by an actor recalling the hideous sequence of events he witnessed. Ryan Walters delivers the speech, which Evans says still affects the whole company. Where the Iroquois once stood now stands the Oriental Theatre. The broad alley behind the theater is ground that many actors will not tread. Evans understands that feeling. During rehearsals for “Burning Bluebeard,” he was offered a one-night gig as Honey Buns at an event at the Oriental. He considered the job rationally and accepted. Then, at the last minute, he was informed he would not be needed. What was the clown-actor’s response? Photo captions and credits: Home page and top: Dean Evans. 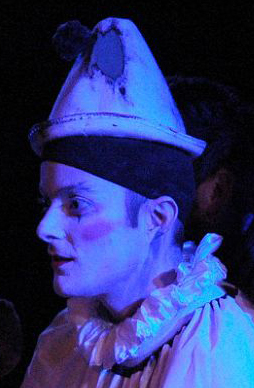 Top right, Evans as Fancy Clown in “Burning Bluebeard” (Photo by Maggie Fullilove-Nugent). 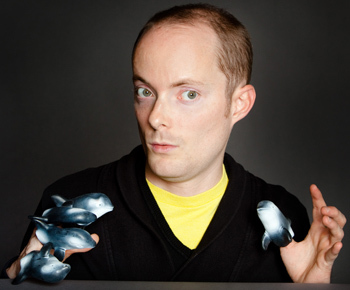 Lower left: Evans as a finger-puppeteer.